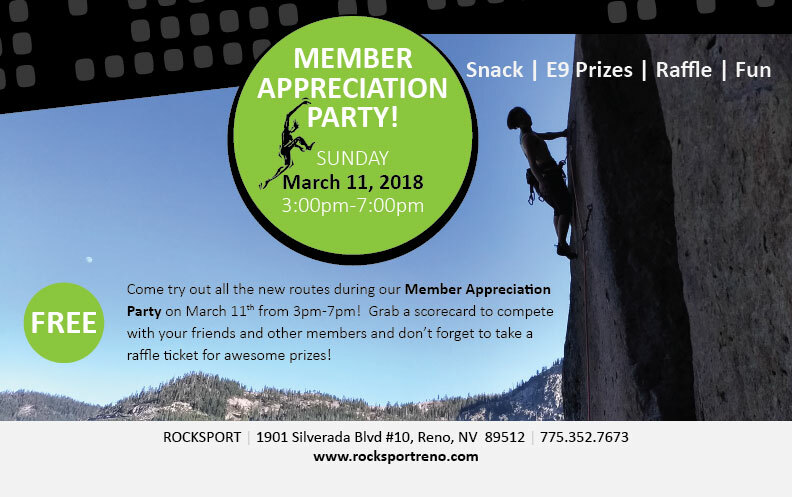 Come try out all the new routes during our Member Appreciation Party on Sunday, March 11th from 3:00pm-7:00pm! Grab a scorecard to compete with your friends and other members and don't forget to take a raffle ticket! Awesome prizes including month memberships, E9 gear, and day passes will be up for grabs! RockSport will be hosting a USAC Youth Sport Competition on Saturday, March 10th for the young competitive climbers in our community! March 5th-10th: Front bouldering room will be open; the rest of the gym will be inaccessible. March 5th-10th: RockSport members climb for FREE at BaseCamp; present member scan card.